TORONTO (June 29) — On Sunday afternoon in Chicago, moments after the 2017 National Hockey League draft, Lou Lamoriello sat alongside Mark Hunter and did what only he can do to perfection. Engaging and cooperative, the Maple Leafs general manager answered questions from reporters; spoke at length about his plan for improving the club… and said absolutely nothing — a remarkable skill that Loquacious Lou has forever mastered. Each reporter left with the same information as when he or she had arrived. My ol’ pal, Steve Simmons, was foremost among those attempting to pry the un–pryable from Lamoriello. Calling upon decades of experience with grizzled hockey executives, Steve asked the same question three different ways. He chuckled. The veteran Toronto GM chuckled. And, still, there was nothing to glean from the words that came forth; in every respect, Lou–101: “As an organization, we do what we do in our best interests going forward. We have a plan and we plan on sticking with it, long–term. If we can make our team better in the short–term, while not harming our future, we’ll look at it. But, we’re going to stick with the program that we all agree is in the best interests of our organization moving forward.” Not surprisingly, poor Steve flew home from Chicago without writing a Lamoriello follow–up and filed his next column, on Tuesday, about managers Buck Showalter of the Baltimore Orioles and John Gibbons of the Toronto Blue Jays. There’s no one quite like Loquacious Lou to make a guy change subjects altogether. 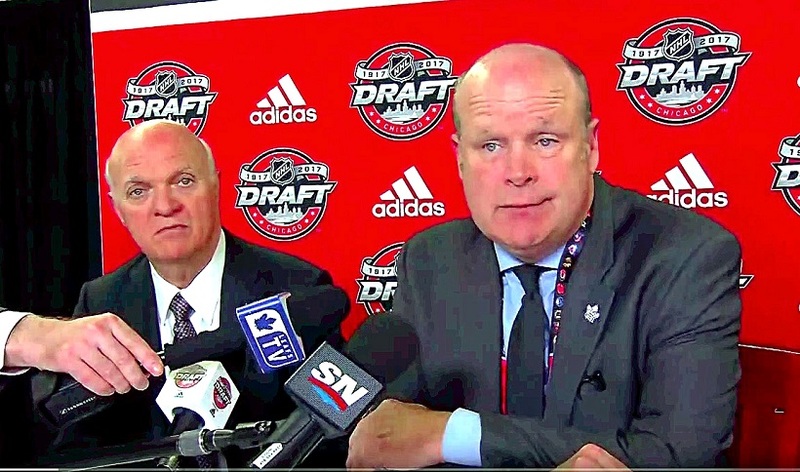 LOU LAMORIELLO (LEFT) AND MARK HUNTER SOLEMNLY ANSWER MEDIA QUESTIONS IN CHICAGO. Therefore, and as Lamoriello wants it, no person outside of his tight inner–circle has a clue as to which direction he will follow — if any — in vying to improve the Maple Leafs this summer: short–term; long–term or in–between. All we can say for certain is this: Lamoriello has the option to do virtually nothing… and walk away with a smile. As mentioned in my blog here yesterday (http://bit.ly/2uiAr0G), the Leafs are in the honeymoon phase of their development, with William Nylander, Mitch Marner and Auston Matthews still under entry–level salary restriction. Fans in this region — and through many parts of Canada — are stone in love with the team that finally ended the Toronto franchise–record playoff absence of 10 full NHL seasons. If there is not a single amendment to Mike Babcock’s 95–point outfit, choruses of “Hail, Hail, The Gang’s All Here!” will echo through Air Canada Centre prior to the home opener, Oct. 7, against the New York Rangers. Not that Lamoriello, if he so desires, could catapult the Leafs toward instant Stanley Cup contention with this year’s middling crop of unrestricted free agents. The GM must also be mindful of money and cap–space soon required to retain the Nylander–Marner–Matthews troika. Still, were he to act aggressively, there are moves available to Lamoriello that could hasten the process without jeopardizing the club’s future; such is the attraction of the open market each July. And, it’s not beyond comprehension that Lou will fish for a Marlin instead of a Minnow. As written yesterday, the mere addition of Karl Alzner from Washington would fill an enormous gap on the blue–line; Alzner, Morgan Rielly, Jake Gardiner and Nikita Zaitsev providing the Leafs a multi–dimensional Top 4. Neither would Alzner likely propel Toronto’s cap situation into disarray. My sense, however, is that Lou will not engage in the inevitable bidding war for any of the top UFA’s. There’s no need to in the honeymoon portion of development, with the club’s enormous fan–base all warm and fuzzy over the current roster. “Stay the course,” chants Leafs Nation while not knowing exactly what that means and how it will impact the future. There is, however, absolute trust in the hockey administration — regardless of Lamoriello’s decline with New Jersey… or that the Leafs cannot “stay pretty” for much longer and expect to make serious inroads. At the moment, plugging a third or fourth–line vacancy; acquiring a fourth or fifth–caliber defenseman, and signing a back–up goalie, will satiate any white noise. 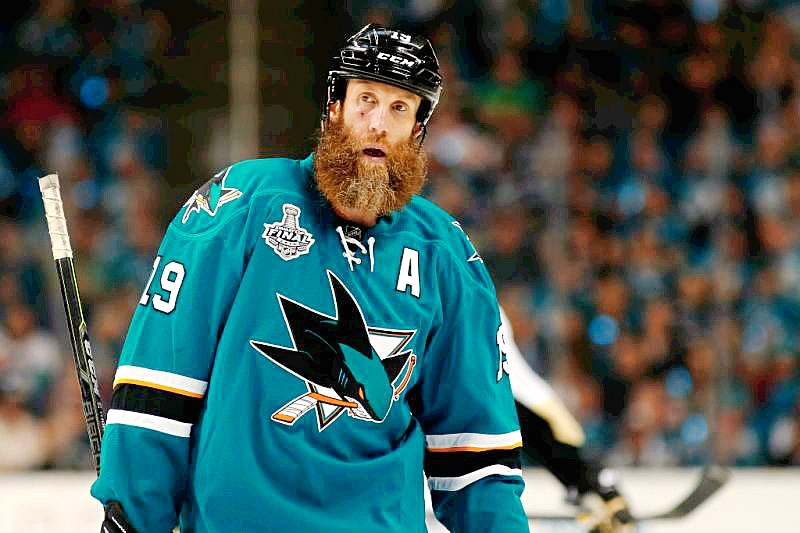 Particularly if the acquisitions include future Hall–of–Famers Patrick Marleau and/or Joe Thornton — long of San Jose — and both reportedly contacted by the Leafs in pre–July 1 conversation. Yet beware: The Toronto honeymoon ends after next season. Enjoy it for one more year. The annual Free Agent Frenzy, as coined by TSN, dates only to 1995 and the Collective Bargaining Agreement that spawned the first 48–game, lockout–abbreviated schedule. 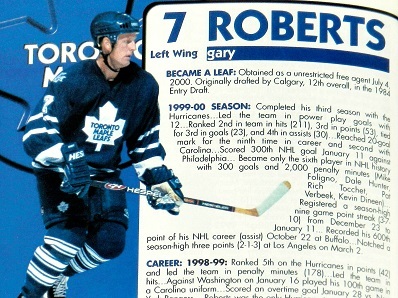 As part of the accord between Gary Bettman and Bob Goodenow, “unrestricted free agent” and “offer–sheet” became part of the NHL’s lexicon. 1995 — Signed forwards Mike Hudson (27) and Brent Gretzky (0). 1996 — Signed forwards Scott Pearson (1) and Daniel Marois (0); defensemen Greg Smyth (2) and Tom Pederson (15). 1997 — Signed forwards Derek King (161), Mike Kennedy (13), Kris King (188), Kevyn Adams (58) and Igor Korolev (297); goalie Glenn Healy (65). 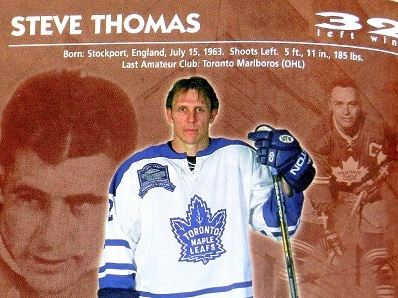 1998 — Signed forwards Steve Thomas (216) and Niklas Andersson (0); defenseman Dallas Eakins (18); goalie Curtis Joseph (249). 1999 — Signed forwards Jonas Hoglund (325), Brian Wiseman (3) and Jason Bonsignore (0); defensemen Greg Andrusak (9) and Terran Sandwith (0); goalie Jimmy Waite (0). 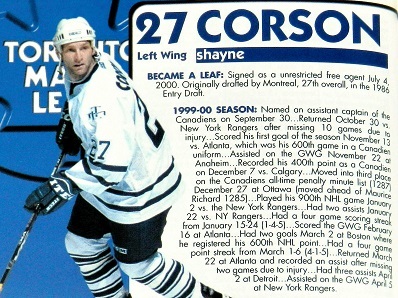 2000 — Signed forwards Gary Roberts (237) and Shayne Corson (197); defenseman Dave Manson (87). 2001 — Signed forward Alexander Mogilny (176); defenseman Anders Eriksson (38); goalie Corey Schwab (30). 2002 — Signed forwards Tom Fitzgerald (135), Aaron Gavey (5) and Nathan Barrett (0); goalies Ed Belfour (170) and Trevor Kidd (34). 2003 — Signed forwards Joe Nieuwendyk (64) and Clarke Wilm (70); defensemen Bryan Marchment (75) and Ken Klee (122). 2004 — No summer acquisitions prior to owners’ lockout and lost NHL season. 2005 — Signed forwards Jason Allison (66), Eric Lindros (33), Mike Hoffman (0) and Mariusz Czerkawski (19); defensemen Alexander Khavanov (64) and Brad Brown (0); goalie Jean–Sebastien Aubin (31). 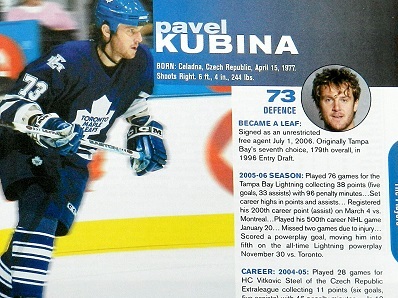 2006 — Signed forwards Eric Westrum (2), Michael Peca (35), Brent Aubin (0) and Boyd Devereaux (118); defensemen Hal Gill (145) and Pavel Kubina (215). 2007 — Signed forwards Simon Gamache (11), Jason Blake (216), David Ling (0) and Tony Salmelainen (0); defenseman Derrick Walser (0); goalie Scott Clemmensen (3). 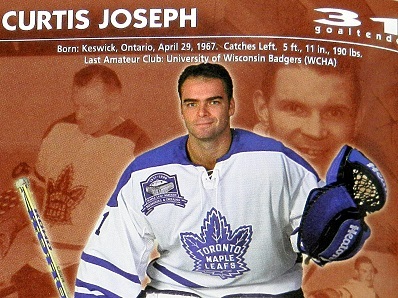 2008 — Signed forward Niklas Hagman (120); defenseman Jeff Finger (105); goalie Curtis Joseph (21). 2009 — Signed forwards Tim Brent (80), Jay Rosehill (72), Richard Greenop (0), Colton Orr (232) and Rickard Wallin (60); defensemen Mike Komisarek (158) and Francois Beauchemin (136); goalie Jonas Gustavsson (107). 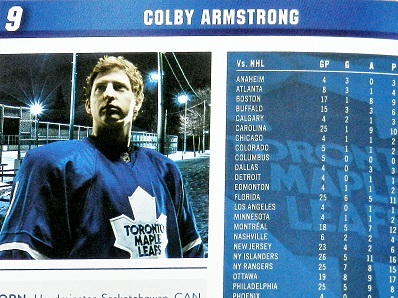 2010 — Signed forwards Colby Armstrong (79), Joey Crabb (115), Mike Zigomanis (8), Marcel Mueller (3), Clarke MacArthur (195) and Andrew Crescenzi (0); defensemen Danny Richmond (0) and Brett Lebda (41). 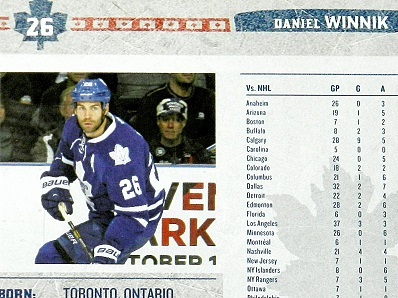 2011 — Signed forwards Tim Connolly (70) and Philippe Dupuis (30). 2012 — Signed forwards Jay McClement (129) and Keith Aucoin (0); defenseman Mike Kostka (35). 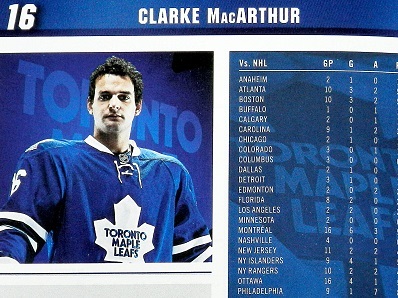 2013 — Signed forwards David Clarkson (118), Trevor Smith (82), Troy Bodie (52) and Mason Raymond (82); defensemen T.J. Brennan (13) and Paul Ranger (53); goalie Chris Gibson (0). 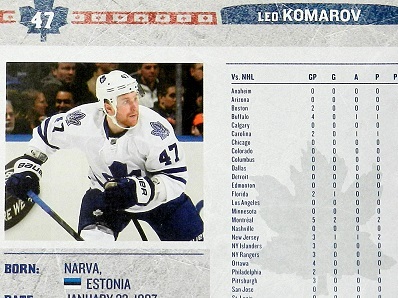 2014 — Signed forwards Leo Komarov (211*), Petri Kontiola (0), Mike Santorelli (57), David Booth (59) and Daniel Winnik (114); defenseman Stephane Robidas (52). 2015 — Signed forwards Mark Arcobello (20), P.A. Parenteau (77) and Shawn Matthias (51); defenseman Matt Hunwick (132*). 2016 — Signed forwards Matt Martin (82*) and Trevor Moore (0*); defenseman Roman Polak (75) and Justin Holl (0*); goalie Jhonas Enroth (6). 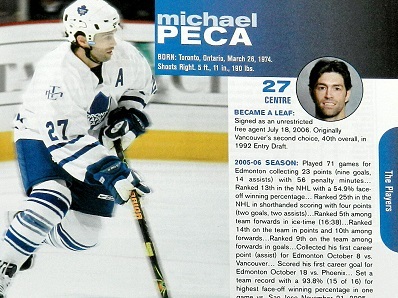 * — Still with the Leafs organization.